For a time branch banks throughout California—and often beyond—played a role in their communities, not just as lenders and as educators, convincing children to open banking accounts, but as objects of art. The trend can be linked to artist Millard Sheets, who, starting in 1956, designed and outfitted dozens of Home Savings banks with murals, sculptures, and mosaics. 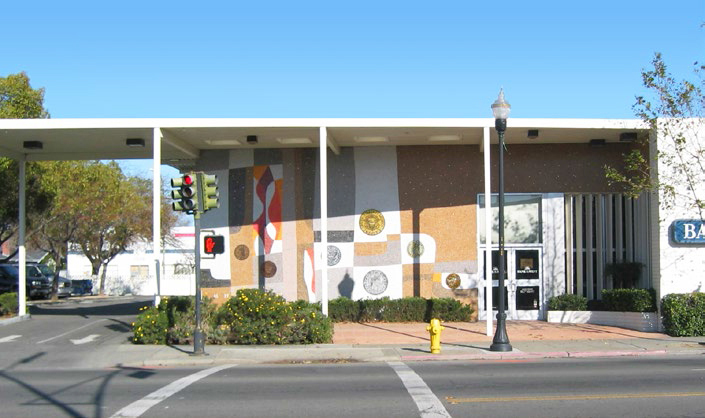 By the late 1950s and early '60s, San Jose's longtime institution, First National Bank, had gone equally modern, bringing modern bank branches complete with public art to neighborhoods and redoing its once-conservative downtown tower in a modern idiom. The branch at South First and Willow, now bedraggled, empty, and available for lease (or worse?) is a superb example of civic- and art-minded commercial architecture. The wonderful mosaic mural is by Mary Henry. Palm Springs preservationists have been fighting to save this modern shopping center and entertainment venue for more than a decade. They have fended off several attempts to destroy the once-swank structure. It was designed by modernist A. Quincy Jones, who would later design homes for Joe Eichler, and Paul R. Williams, a pioneering African American architect who worked in a variety of styles. The center won popularity in the growing community of Palm Springs when it opened, and praise in the national architectural press. Its dining room and lounge became the place to be. "The Town and Country Center is one of the best examples of the International Style of architecture in Southern California, and is an important early 'mixed use' development. It is also architecturally noteworthy for its pedestrian-friendly open-air courtyard which creates passage between two prominent streets," the National Register nomination stated. Now the owner is pressing to rehabilitate the center and is working with an esteemed architectural firm, Marmol Radziner. But some leading desert preservations have doubts. After a meeting in late 2018 on the plan, the Palm Springs Preservation Foundation reported a "general sense…that a significant amount of the [Town & Country's] historic fabric…was being proposed for demolition." Are the world's great designers the best spokespeople for their own designs? Not in the case of Eldon Davis, who with partner Louis Armet, designed thousands of outlandish fast food and coffee shops throughout the United States and Canada, including this striking example, which lovers of Googie architecture desperately hope to preserve. "I can't see why they'd try to preserve any of them," Davis told the Los Angeles Times in 1986, as the paper recounted in its 2011 obituary for the architect. "We would have liked to have made them more aesthetic, but we were just designing them to sell hamburgers." Fans, though, see these increasingly rare examples of roadside mid-century design as wonderfully wacky retorts to the increasingly bland architecture that is taking their place—and as historically important too. 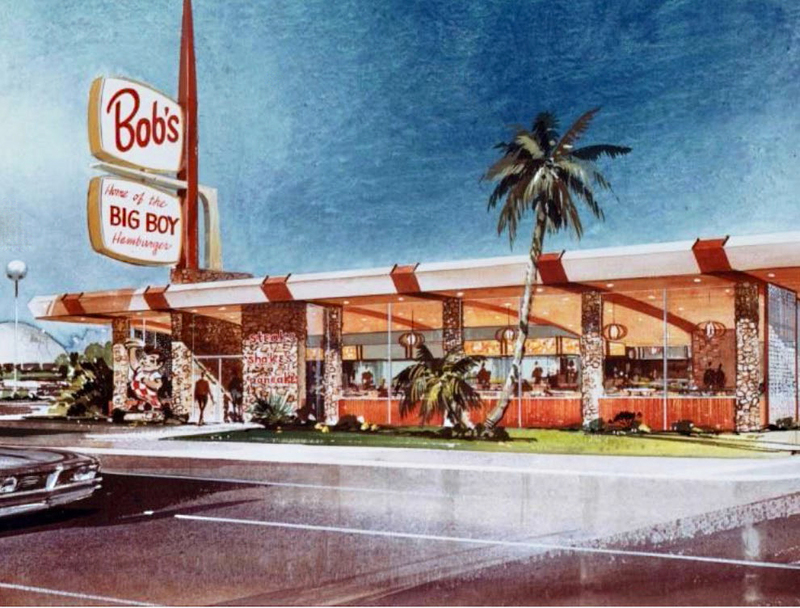 San Jose preservationist Heather David believes the Winchester Avenue structure, which started out as a Bob's Big Boy restaurant in the 1960s and then became Flames Coffee Shop for 25 years before closing in 2016, may be the only example of a Big Boy based on Armet and Davis's original, 1958 prototype design remaining in the Bay Area. It may soon be gone, though, to be replaced by the Santana West Tech Campus, which would also displace—though partially preserve—another iconic mid-century landmark, the Century 21 Dome.